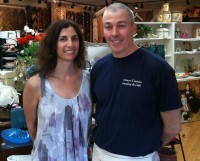 Ginny and Ken Ryan own Fro-Yo Fusion in Mahopac and Somers Custom Framing & Gift. If you want to cool off with a frozen yogurt or a smoothie you can patronize Fro-Yo Fusion in Mahopac. If you want a frame or a gift, you can shop at Somers Custom Framing & Gift. What do these establishments in two counties have in common? They are both owned by North Salem residents Ginny and Ken Ryan. The couple opened Fro-Yo Fusion in May 2012, moving the yogurt shop from Brewster, where it originally opened in the fall of 2011. “It’s a lot healthier than ice cream for sure,” Ryan said, adding her frozen desserts range from lactose free sorbets to fat free, low fat, peanut free and no sugar added yogurts. The store also offers candies and a variety of beverages, including fresh fruit smoothies. Fro-Yo Fusion hosts children’s birthday parties and also has a portable freezer which goes to a variety of events. The Ryans’ children are very active athletes and the couple regularly helps out with teams by such means as providing free yogurt to young players on several local teams. “The coaches get in touch with us and we’re more than happy to support them,” Ryan said. The Ryans also supply frozen yogurt for the Brewster Sports Center, where the business was originally opened, and to Kobackers Market in Brewster. The yogurt shop is not the first business owned by the Ryans. They opened Somers Custom Framing & Gift in December 2006. The store sells gifts and provides framing and printing services. Ginny Ryan does printing, art reproductions, graphic design and photo restorations, while her husband does the framing. “He knows everything that you need to know about picture framing, designing kind of cool frames or ways to create a frame to frame different sorts of objects,” Ryan said. The framing services have twice earned Best of Westchester awards from Westchester Magazine. There is a wide range of frames created by her husband and sold at their store, Ryan said. “He works with some pieces that are priceless and some are just are your every day frames,” she said. For her work for Somers Framing, Ryan uses a studio in a separate apartment at their home. The couple attends international gift, toys, custom jewelry and accessory shows between five to seven times a year to purchase items for the gift shop portion of their Somers business, Ryan said. “We see what the latest trends are,” she said. The gift store also features seasonal foods and gift baskets are available. In addition, antiques are sold and the gifts change based on the season of the year. “There’s something for everybody,” Ryan said. Fro-Yo Fusion is located at 606 Route 6 in Mahopac. For more information, call 845-803-8074. Somers Custom Framing & Gift is located at 253 Route 202 in Somers. For more information, call 914-276-3173 or visit www.somersframing.com.